We’ve spent the past few days galivanting up and down the Oregon Coast with friends visiting from the U.K. Two months ago, we were doing the same with a couple up from Palm Springs. Last year it was my family from Massachusetts, the year before, my sweetheart’s sister from New Jersey, and in two weeks, long-time friends from the southern part of the state will join us, gasping for sea air after a summer surrounded by wildfires. Every visitor has brought sunshine, literally. Those who’ve stopped by for an hour or two on their way through town have had a magical effect on our storied dreary weather. 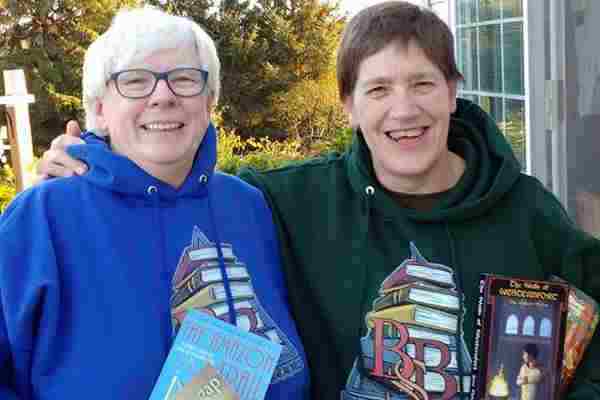 While Phyllis and Nancy may have brought good weather from Southern California with them, we can’t say that Jane Fletcher, the brilliantly imaginative fantasy fiction writer from England, and Joanie Bassler, her lively American wife, brought good weather with them. The British endure Oregon-style precipitation levels and coastal storms at home. Yet, their time here could not have been brighter, drier, calmer. Under such circumstances my sweetheart and I could do nothing but enjoy a spate of convivial visits. Our small commercial fishing town can’t brag of Broadway lights, ancient ruins, or vast museums. We are not high on the destination vacation list. Mother Nature is the draw here and we are fortunate to have friends who enjoy her many glories. Take the whales, for example. We spent most of one day with the pond-crossers, waiting breathlessly for signs of whales. Jane found a pod of six leviathans not far from us, timed their progress, and we watched as they swam in a straight line, like an old steam train with six engines spouting along their watery tracks, perfectly synchronized. This was no fantasy. With Nancy and Phyllis, the elks provided the thrill. We took back roads home from an excellent Mexican restaurant and lucked out. Perhaps a dozen or more elk were having siestas within sight of the road. Nature offers such cheap plentiful entertainment. The back roads also afforded views of ramshackle barns with caved-in roofs, palomino and pinto and chestnut-colored horses, baby lambs gamboling, placid cows chewing their cud. A little waterfall at the side of the road, old farm houses, and a sparkly tidal river. It’s a gift, spending time with friends whose wild days, like mine, are behind them. Who get excited talking about birds and searching them out. Whose enthusiasm rises when comparing the birds of England, of the desert, of the coast. The colors of feathers, the patterns of flight, our imitations of calls. Where we saw them, which ones we’d like to see. Watching the cormorants settle in the for night on immense, craggy, exposed rocks, and the grebes when they bob over waves. The sudden dart of a small bird through the sea grasses and a line of pelicans flying low. We went out to see the sunset and got entangled in the lives of birds. And the talking. We seem to make friends with writers and readers. None of us can go ten minutes without some literary reference. I don’t read fantasy novels or any speculative fiction, but listening to Jane Fletcher talk with fervor about world-building and monsters and sorcerers, turned everything fantastical. I felt as if we lived on a magical floating ball where a group of old-hippy-like beings who called themselves Wanders colored the sky with gigantic wands akin to the ones we use to create bubbles. After Kajmeister and her daughter stopped on their way from Portland south to get together for lunch, I became a devotee of her blog. She is a smart, witty raconteur on subjects that range from homey to cinematic to political. These lesbian friendships that come with age are rich with experience and the certainty of uncertainty, a sort of we’re-all-together-in-this-brief-thing-called-life-let’s-enjoy-one-another. Next week our sailing friend will be driving south. She figures it’s her last long trip away from home as her physical abilities decline. We’ll be foraging for organic salad at the food co-op with her, reminiscing about the gay rights battles we’ve been through, and the days we’d fax each other hourly just for the excitement of that new technology. The sunset tonight is gray and peach, altogether different from the palette of the Wanders two nights ago. It’s their warning: our friends have left, the rains are coming in. The sailor and the Southern Oregonians are Northwesterners, they’ll arrive with clouds in their wakes and raindrops on their wet weather jackets. Then, like the visitors, the goldfinches will be gone, the sunflowers will make their last bows, and my sweetheart and I will cuddle up to listen to the rain on our roof.